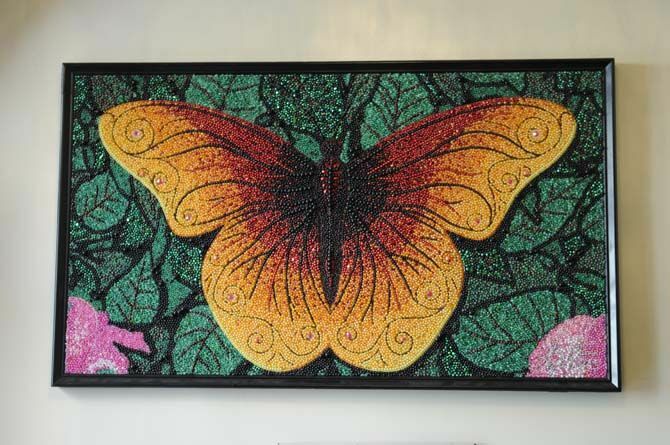 Recycled Mardi Gras bead art by Stephan Wanger is on display Saturday, Feb. 7, 2015 inside of Little Vic’s Rosticceria. "Walking To New Orleans" is part of the recycled Mardi Gras bead art by Stephan Wanger on display Saturday, Feb. 7, 2015 inside of Little Vic’s Rosticceria. Recycled Mardi Gras bead art of St. Louis Cathedral in Jackson square by Stephan Wanger is on display Saturday, Feb. 7, 2015 inside of Little Vic’s Rosticceria. "Center of the Universe" is part of the recycled Mardi Gras bead art by Stephan Wanger on display Saturday, Feb. 7, 2015 inside of Little Vic’s Rosticceria. Hands in the air, faces full of joy and beads flying can only mean one thing: Mardi Gras. While most festival goers focus on racking up beads during parades, they lose interest in the plastic necklaces in a matter of days. One New Orleans artist, Stephan Wanger, thrives on the multicolored throws long after Mardi Gras is over. A few blocks from the world-famous Bourbon Street in New Orleans is Little Vic’s Rosticceria on Toulouse Street, which specializes in Sicilian street food and Mardi Gras bead art. Wanger, a native of Germany, moved to New Orleans after Hurricane Katrina to help rebuild the city, drawing from a time when people didn’t want to rebuild Germany after the world wars. Wanger began as a carpenter’s assistant, but started working with Mardi Gras beads in 2007 in an effort to promote Louisiana, the community and an important environmental action — recycling. The theme of each of Wagner’s pieces is dependent on what’s current at the time. Wanger remembered the fifth anniversary of Hurricane Katrina and the Deepwater Horizon oil spill in 2010 with a piece called “Nola’s Resilience.” He orchestrated a jazz funeral down Canal Street to promote the piece and donated the money raised to several charities. Plans are in place for another jazz funeral in August to commemorate the storm’s 10th anniversary and attempt to sell the piece again at its $1 million asking price. If incorporating Louisiana culture wasn’t enough, Wanger incorporates children from the community into his artistic efforts as well. Bead Town is his interactive traveling exhibit where he collaborates with children in different communities all over the country. Wanger has plans to take Bead Town to Gary, Indiana, this summer to construct 20 pieces highlighting the steel town that has faced poverty since the ’70s, hoping to bring back inspiration dashed by a cityscape of destroyed buildings. The recycled materials used in each town are tailored to what the city offers. Indiana’s Bead Town will include pieces depicting both Michael Jackson and Oprah Winfrey constructed out of the town’s nails, screws and bottle caps. Wanger will also begin his next Guinness World Record attempt while he’s there with a 96-foot long work showcasing the Joan of Arc parade in the French Quarter. This length is double the 48-foot long piece currently holding the record for world’s largest mosaic. He doesn’t just start gluing beads to plywood, though. There’s a meticulous process before each work comes to life. With the creation of more than 150 pieces over the last eight years, Wanger splits his time between his personal creations and partnering with the community. He sells his personal work, but won’t sell any collaborative efforts. Wanger will inevitably come away from this Mardi Gras season with more beads than he needs, but has a plan for surplus. Both St. Michael Special School and the Arc of Greater New Orleans work with or employ individuals with special needs to sort beads. He will take his beads there and suggests people take their extra beads there as well. Wanger’s art changes the aesthetic of Mardi Gras beads. He said people are eager to take photos or touch each artwork, but the medium is family friendly, to say the least. “The life span of the beads in the murals is longer than the beads we’re going to receive [from parades],” Wanger said. Wanger said he’s working on creating a space to show and sell his artwork because some of it, including the 48-footer, is currently in storage. As for his works on display in Little Vic’s, they are for sale and depict different New Orleans themes — some are even glued on doors salvaged from Hurricane Katrina. One of the more recognizable pieces in the restaurant is a mural featuring St. Louis Cathedral in Jackson Square. The $18,000 photorealistic work from Wanger’s private collection encompasses minor details. He included the cathedral’s stained glass windows and even included Vic, the co-owner of Little Vic’s, as a street vendor out front. Shawna Gunsch, a customer at Little Vic’s, said she came for dinner after seeing the St. Louis Cathedral, and couldn’t believe her eyes. 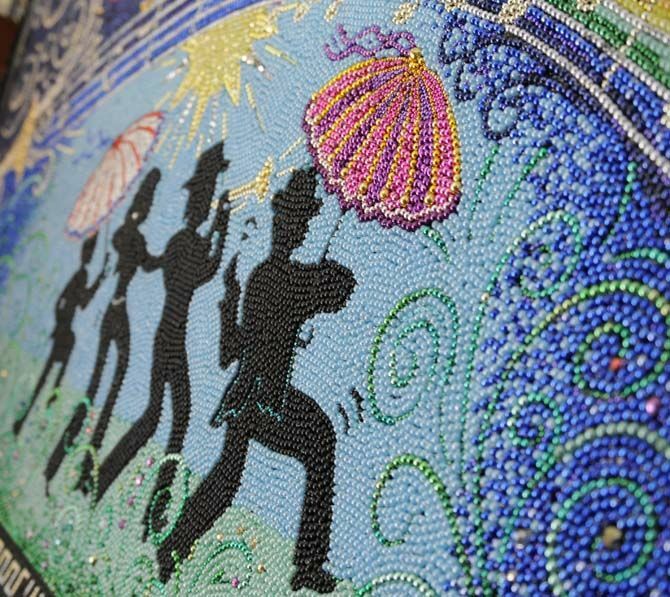 From far away, each piece is a vibrant image, but when individuals get up close with the bead art, they’ll discover the variety of bead sizes and colors in the work. You can reach Greta Jines on Twitter @TheGretaJines.